Frame is a white pattern in horses that puts white on the barrel and the face of a horse. It tends to leave white markings with jagged edges but no "halos" (areas of dark skin under white hair) or roaning. Frame can cause blue eyes and face white but prefers to leave the legs solid. Horses positive for frame can have leg white, but it must be added by a separate white pattern. Any color horse can be a frame carrier and frame's expression can very greatly from a "solid" animal to one who is wildly marked. Frame will rarely cross the top line of the horse without another white pattern being present. Because of frame's wildly varying expression, as well as its ability to "blend" with other patterns, it can be very difficult to tell if a horse carries frame simply by visual inspection. 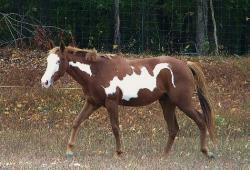 Frame is the gene responsible for Lethal White Overo Syndrome. It is therefore important, for everyone who may breed a frame positive horse, to understand how frame is inherited and how it affects foals. It's quite common for countershading to be confused with dun markings. What is countershading? It's not known what causes countershading type markings but they are believed to be a type of camouflage. 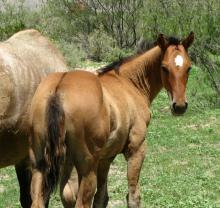 Countershading is more common on foals but can appear on adult horses as well. Countershading markings that can closely resemble dun are false dorsals, shoulder bars, and stripes or mottling on the legs. It is usually possible for a trained eye to distinguish between the two even on foals but at times even experts can be fooled. The most important thing to remember is that a dun foal must have a dun parent. It is sometimes possible for dun to "hide" in that it can be covered by gray or white patterns but generally speaking if the horse has no dun in its near pedigree then it's not dun but countershading. How much difference can nutrition make in a horses coat? Horses are non-ruminants meaning that unlike cows and goats they only have one stomach. They also are unable to regurgitate food. This mean they can't "throw up" if they eat something that is poisonous or something that upsets their stomach. It is therefore important to only provide high quality feeds and forage.